Hello and welcome to exampundit. So, we will be sharing regular Vocabulary Updates from The Hindu Editorial. 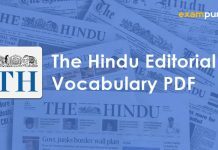 So, The Hindu Editorial Vocabulary PDF will be important for upcoming Bank PO and Clerk Exams. The followings are taken from the editorial of The Hindu “The heat is on: protection during summer“. You can find the article from here. Definition: not even or regular in pattern or movement; unpredictable. Definition: (of a person) unable to walk or move properly; disabled. Definition: postpone consideration of or action on. Definition: the capacity to recover quickly from difficulties; toughness. So, these are taken from The Hindu Editorial, Country before party: on Theresa May’s Brexit plan. You can find it from here. Definition: give or grant someone (power, status, or recognition). Definition: a situation, typically one involving opposing parties, in which no progress can be made. Definition: in a forceful, passionate, or intense manner; with great feeling. Definition: make (someone) extremely angry and impatient. So, these are taken from The Hindu Editorial, Probing the probe: on HC remarks on Jayalalithaa death probe panel. You can find it from here. Definition: the desire to harm someone; ill will. Definition: a feeling of doubt or apprehension about the outcome or consequences of something. Definition: destroy or impair the legal validity of. Definition: an affirmation or allegation. Definition: an attack on the reputation or integrity of someone or something. Definition: (of a person or action) creating or controlling a situation rather than just responding to it after it has happened. So, these are taken from The Hindu Editorial, Capital high: foreign investment in India. You can find it from here. Definition: the path followed by a projectile flying or an object moving under the action of given forces. Definition: defeat and cause to retreat in disorder. Definition: the quality or condition of being strong and in good condition. Definition: supporting discussion or other peaceful solutions in political relationships rather than the use of force. Example: He is a dovish politician who was one of the signers of a model peace treaty.